First you’ll combine your salt and flour in a bowl and slowly add in the water. Continue until it is dough light and not too sticky. If the dough is too dry you can add more water. After kneading the dough you’ll flatten it out with a rolling pin. The kids love helping with this part! Next have your child place their foot in the dough. I cut out circles big enough for their foot and sat them in baking sheets lined with parchment paper so they could do this step a little easier. Next you can trace around their footprint leaving a little border around the print so that you have enough room for the hands to be painted on. Poke a hole through the top so that you can hang them when your done and bake these for two to three hours at around 100 degrees C/ 200 F. If your ornament is thick you may need to turn it over while it’s cooking. Once these are done and they’ve cooled for a few hours you can start painting! 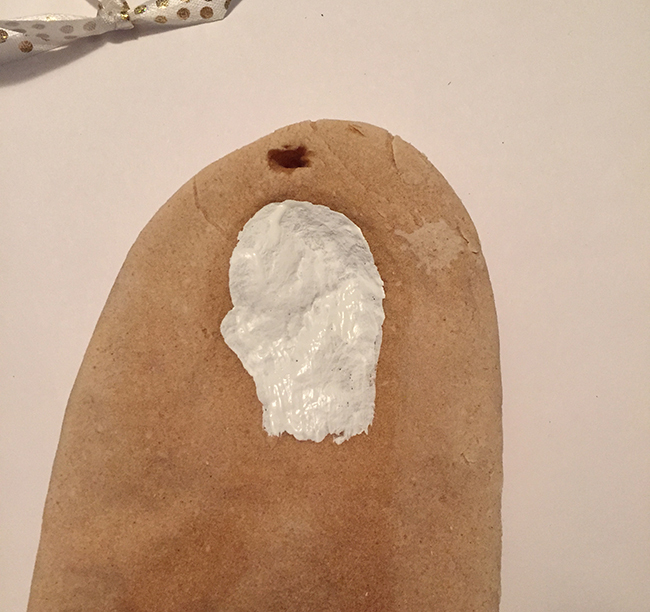 Using acrylic paint you’ll paint the footprint white and add little cheeks to give it that olaf look! I added in a blue border and to make the eyes and mouth, I found the easiest way was to use permanent marker. Add a festive Christmas bow and it’s ready to hang on your Christmas tree! We had a few readers leave us some awesome tips to make these ornaments last! Spray with a waterproof sealant and keep in ziplock bag. 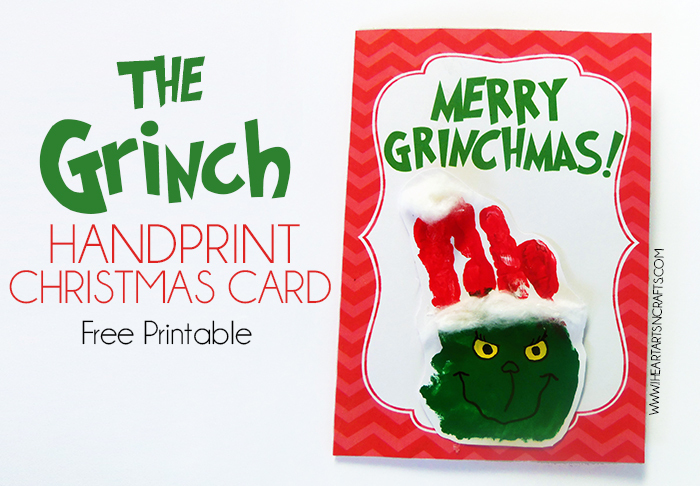 Love this adorable holiday craft? Make sure to pin it and follow me on Pinterest for more fun kids crafts and activities! 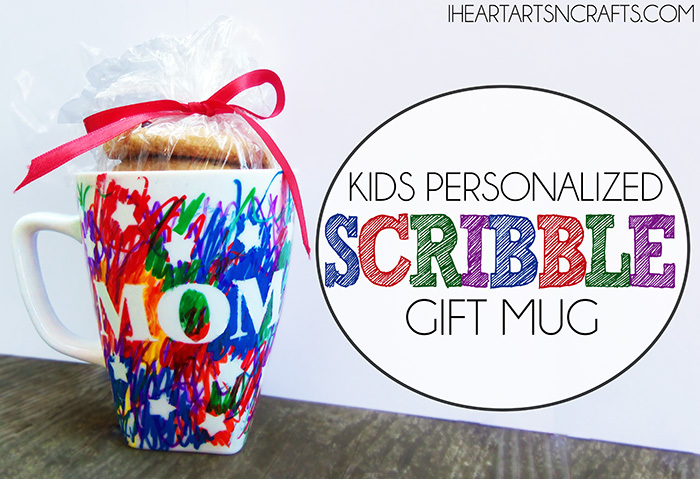 You may also like our Kids Handmade Christmas Scribble Mug – Makes the perfect gift for the holidays! Such a great craft idea!! You did a great job with it. I have a feeling this ornament is going to be pretty popular. I shared it on my Facebook page today!! I teach two and threes. Love doing things with their hands and feet. So cute! I’ve got to try this. My daughter is 15 and wears a size 10 but I’m making her do it now ….. Lol we love crafts. We have since she was small. Gonna do the dogs foot prints also. They are my baby’s also. 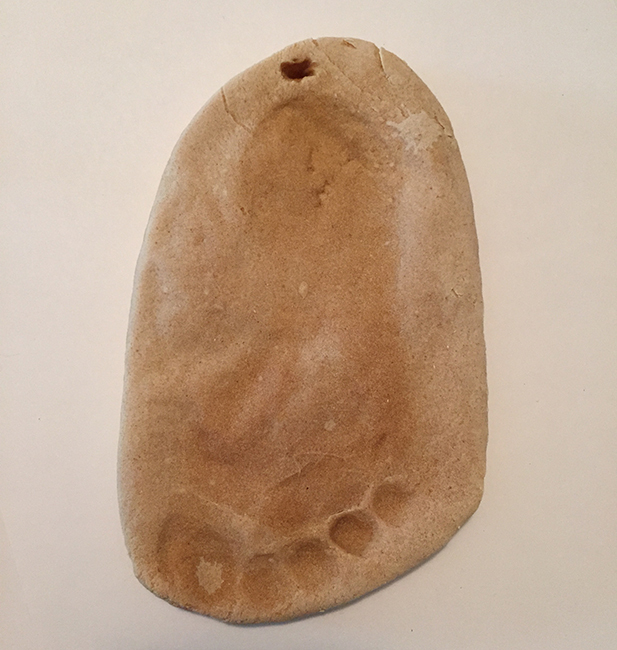 I was wondering if I was going to have to borrow a baby.My youngest grandchild is 10.I don’t want the ornaments to take up the whole tree.Have you taken a picture of the one with your daughter’s footprint? Maybe you could use it as a stepping stone. That was my idea to try because my youngest is 11. I was thinking of making a set of my whole family (6 of us) and hanging them on the wall during the holidays. We have some pretty big feet in the family & a tree would never support them, but my wall can. These are absolutely the cutest ornament ever!!! Thanks so much for sharing with us today on our Facebook page. Pinning and sharing this week, everyone loves Olaf! does it matter what kind of flour we use?? I don’t have white (all-purpose), but I’ve got lotsa old food storage wheat – I’d love to grind it up and use it for this! Would that work??? It’s going to be baked and painted. I cannot imagine it making a difference. The one in the picture isn’t white, so I’m suspecting that she used whole wheat flour. Could even be done with rye or something else, I imagine. So cute ! But has anyone just let the ornaments dry instead of baking them ? I work with two year olds and my job does not have an oven. Thanks ! I did something similar without having a oven. I suggest you make them one day and take them home to bake them.Then they paint them the next day. It breaks up the project and they can’t wait to see how their foot turned out after being baked. Jenn-I have made similar ornaments using this recipe. It doesnt have to be baked. This is amazing!! I think I might have to do this as christmas gifts this year… But I’m assuming this is probably only enough ingredients for one ornament? I’d like to do a bunch. Any ideas? Thanks!! I was able to get three little feet ornaments out of this! They were for a one year old. Last year we made handprint Santa’s with this same idea and dough. They were gifts to grandparents from my son. This year, we’ll be doing these! So excited! What temp do you bake them for 2-3 hours? A lot of sites say 200 degrees, but I have also read that it is best to bake these at the lowest temp your oven will go, most likely 170 degrees. Ideally air drying is the way to go, but the disadvantage is it takes up more time. The reasoning behind the higher temp versus lower I believe is helping to eliminate air bubbles. 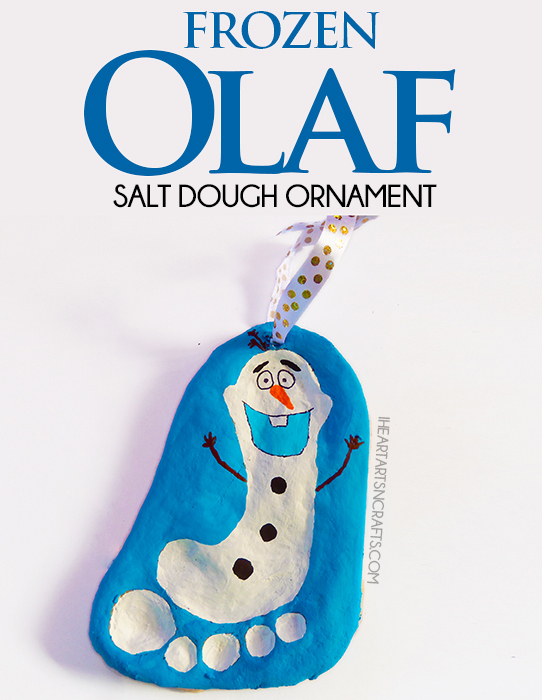 My daughter and I love to do crafts…this looks like a perfect one especially who does not like OLAF! Can’t wait to get started. this is the cutest Olaf ever! What a brilliant idea! Has anyone painted them before baking? Want to do this with our 4-H group but cant get it done in one day. Then we don’t meet again for a month. Hi Danny, while your adding the water to the mixture make sure to add it slowly until it appears dough like and not too sticky there should be no residue on your hands when you touch it. You can try adding in more flour while you knead the dough. And maybe a little bit on your childs foot incase your dough is still coming out a little sticky. My grand daughter went haywire when she saw this…so we tried it. After I baked it for 3 hours, I let it cool for 30 min and painted the white base coat. I noticed that the white paint cracked after it dried, any suggestions? Other than that, the project is great and you instructions very clear. how many ornaments does this recipe make? I need enough for 20 for my daughter’s class. If anything, I guess we could just do white paint footprint on a piece of blue paper. Thanks! I love the Olaf idea! 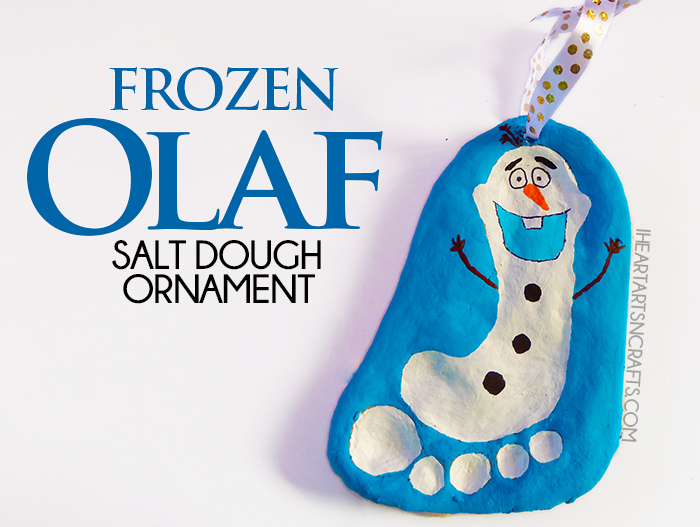 We made salt dough ornaments last year and love them! One tip is to spray them with a waterproof sealant. This will make your ornaments last, and gives a glossy finish. Thank you so much Angie for the tip! I’m going back and the sealant to all of our ornaments! Very interesting post. This project is really amazing, really a cute one and looks very fun to make. Thanks for sharing 🙂 Well done!! Your website is beautiful! 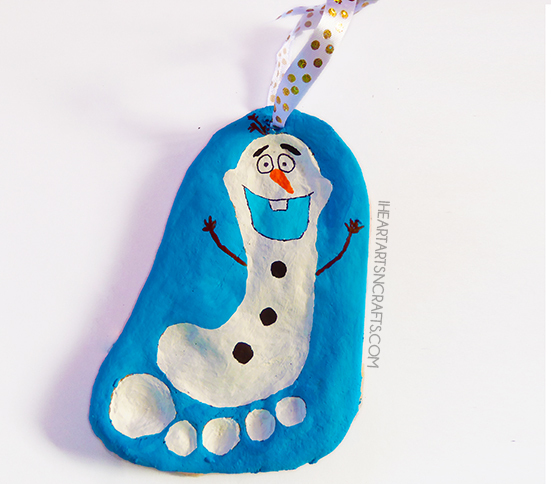 I just did a post called “10 Fantastic Frugal DIY Christmas Decor Ideas” and I featured your adorable “Olaf” ornaments. Thought you might be interested in seeing it! If you enjoy, feel free to share!